There are 2 assessments in this package. There is one assessment on multiplication and one assessement on division based on the Ontario curriculum. Each assessment has a rubric and is divided into 4 sections: understanding, problem solving, communication and application. 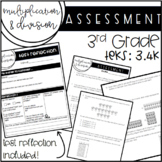 This common core assessment will test your students on their mastery of the standards 3.OA1, 3.OA.2, 3.OA.3 and 3.OA.8. Students will demonstrate their knowledge of multiplication, division, both concepts using pictures, and word problems. 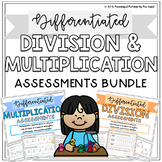 Included is a multiplication and division assessment linked in with AusVELS. Questions range from AusVELS Level 1 through to Level 4. This assessment can be used as a informative or a summative assessment. 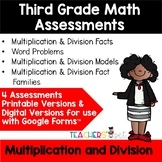 It covers all the multiplication and division standards for third grade. It is written in FSA format according to the test item specifications. There are 16 questions but some have multiple parts. 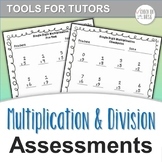 These are the math assessments for Chapter 2 Multiplication and Division of Decimals in the Common Core. They can be modified to meet your needs. PRODUCT DESCRIPTION This is an assessment task on basic number operations/algorithms (addition, subtraction, multiplication and division) that start with easier questions and end with harder. This helps you as a teacher work out where your students are, and what concepts they might not understand. This assessment can be used as a quick check for understanding the concept of multiplication and division with the use of arrays. Could also be used in an interactive math notebook. 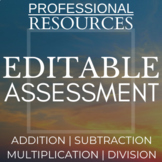 - Multiplication and Division units 1-5 and 10 with arrays - includes multiple select and answer grid questions - aligned to EngageNY Module 1 - Developed by Principal Practice This work is licensed under a Creative Commons Attribution-NonCommercial-NoDerivatives 4.0 International License.